Goodbye, squash. Goodbye, pumpkin. Goodbye, apples and cinnamon. I regret to inform you, your time here is through. You are now out of season. You are old news. With December just around the corner, you will be surpassed by the wonderful meals of wintertime- savory soups and stews, hearty roasts, comforting pot pies, and dazzling christmas cookies…. But as I push the cans of Libby’s towards the back of the pantry, throw the remaining gourds outside for the deer, and roast this last lone Acorn Squash, I will reminisce on all the good times we had cooking together over the past few months. See you next Fall, my friends. Cut acorn squash in half down the center. Scrape out seeds and discard. 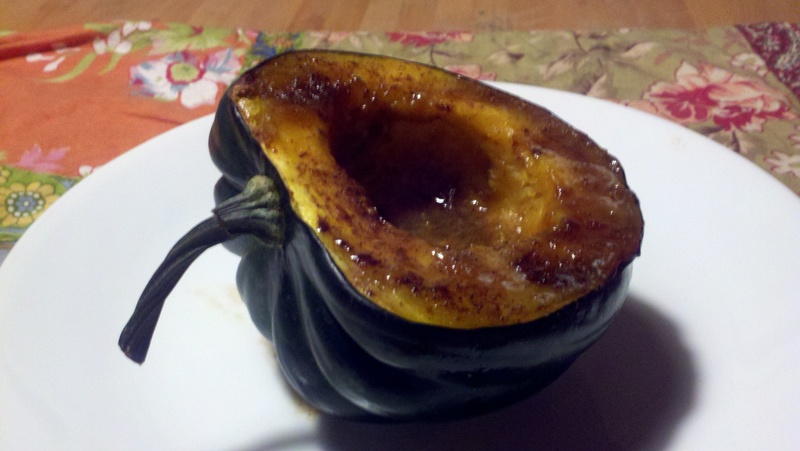 Rub softened butter and brown sugar all over inside of squash halves. Drizzle insides with honey and sprinkle on cinnamon and nutmeg. Season with S&P. Place squash halves on a baking sheet and bake at 350 for about 30 minutes or until fork tender.